Here is another quick and easy meal. This one is great to impress the overnight guest, treat yourself when there is none, help a hangover, or teach your kids the proper way to start the day. Cook the Applewood Smoked Bacon slabs in a frying pan until crispy. Set aside on paper towel to drain. Fry the grated potatoes in the bacon grease at a high enough temperature to brown them. Sprinkle with truffle salt. Then flip them over and brown the other side. Trufflize the other side. Keep pressing with spatula to make a giant pan-sized hash brown patty. When both sides are brown, lower heat and finish cooking in covered pan or move to oven and bake at 350. Grill on the Panini maker until bread is browned with grill marks and cheese is melted. If you don’t have one, buy one. Krups and Williams Sonoma (Breville) make the best ones. 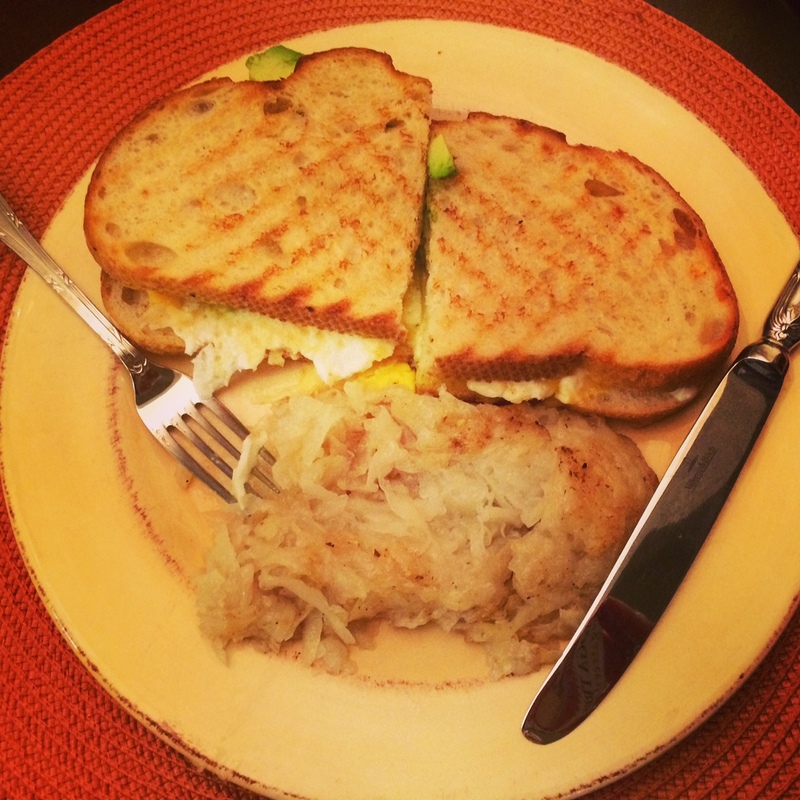 Slice the sandwich in half (between the two eggs) and plate with a portion of hash browns. Serve with a mimosa of course.